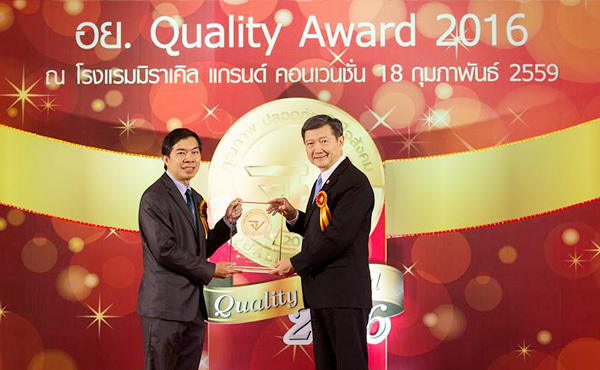 Lam Soon (Thailand) was granted the “FDA Quality Award” 2016 by the Office of the Food and Drug Administration (FDA) for its achievement for a morally and ethically relevant workplace in food manufacturing based on the quality standards with the system to respond to customer needs, and implementing corporate social responsibility (CSR). The ceremony held at Miracle Grand Convention Hotel on 18 February 2016 was presided over by Clinical Professor Emeritus Dr. Piyasakol Sakolsatayadorn, Minister of Public Health. This year, the awards were granted to 51 companies from various industries classified into food, drug, cosmetic, medical device and household and public health hazardous products with morality and ethics in producing healthy products. The awards are granted based on the criteria of reliable standard focusing on quality systems and responsibility to society.